Need a reliable trailer service? Check out NTTS professional team! NTTS is proud to have a knowledgeable team of technicians able to deal with any issued related to your trailer. Should it be trailer leasing, rental, or maintenance and repair as well as other value added solutions to transportation and logistics, we do it all. We provide you with products and services from all over the Canadian territory. In our one-stop-shop all your needs are managed by a single point of contact. At NTTS you can combine our value-added services to create your own trailer-made solution! All our hitches are installed by NTTS Breakdown certified mechanics. Our technicians are experts in hitch installation, and wiring. The actual hitch installation usually takes only about an hour for a bike rack installation, and between one and two hours if we are wiring it for a trailer. We perform all the maintenance services to prevent contamination of your spindles. We do both the replacement and fixing of the actual spindles. A licensed spindle installation from NTTS Breakdown will definitely save your time and efforts. Having a possibility to repair your trailer 24/7 is very practical since you never know when the breakdown will occur to you. That is why we provide affordable 24/7 service to trailers throughout all Canada. When you experience issues with your trailer, roadside assistance is not something you have time to wait for. So, NNTS offers 24/7 semi-trailer repair and 24 hour trailer repair to get you back on the road safely, so you can pursue doing your business. 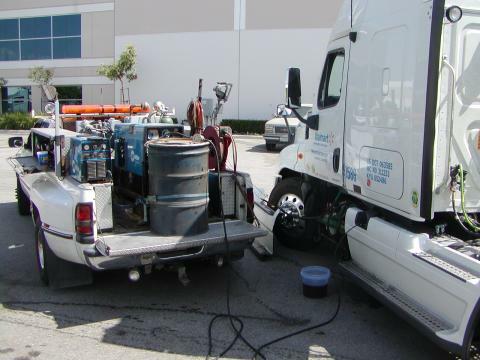 We are always accessible and equipped, so feel free to call our semi-truck repair shop whenever you need help. With NTTS you will have your trailer on the move again! Are You Looking For Trailer Service And Repair? So, if you want to minimize your time and solve your trailer problem very quickly, please contact us and our dispatchers will get back to you.